As online gambling becomes more prevalent in many parts of the world, people are seeking out new and innovative sites to place bets on everything from American football to the World Cup. They also look for sites whose offerings are not restricted to sports betting, permitting gamblers to play their favorite casino games online against a virtual “house.” One such site is PaddyPower.com, based on the Isle of Man. This site offers an impressive mix of sport and casino-style betting and play, as well as advice and resources for the experienced gambler and the novice alike. Let’s take a closer look at PaddyPower.com. The layout for PaddyPower’s homepage is fairly straightforward. It showcases the hottest betting tickets such as the World Cup, odds and payouts for various actions by team players, and gives a decent overview of the day’s match-ups. The minimalist style of the homepage makes finding what you want to bet on simple, and they offer a surprising array of events to bet upon. You can bet on chess, darts, and cliff diving, just to name a few of the more interesting choices. Dedicated gamblers who follow the global stock markets can even bet on how the markets or individual assets will perform. This diverse mix of betting options makes PaddyPower one of the more inclusive and interesting sites out there. The site loads quickly and nimbly from a home computer, but accessing it from a smart device can sometimes lead to frustration. A great deal of PaddyPower’s accessibility depends on the time of day and the user’s location when logging on through mobile means. Therefore, this site is currently better for the at-home user than someone trying to place a bet on the Underground. However, PaddyPower offers a call-in betting service which offsets this problem to some degree, largely depending on player preferences. PaddyPower.com currently supports only two forms of currency: the UK Pound Sterling and the Euro. Gamblers residing in areas not serviced by these currencies but who wish to make bets and are lawfully permitted to do so under global online gambling law may place their bets through online payment processors and convert their home currency to the pound or Euro. Once a currency is chosen for an account, it cannot be changed after the fact. To change the currency, an account has to be closed and a new one opened. Note that PaddyPower does not permit multiple accounts at one time. PaddyPower accepts an impressive range of bank and online debit and credit cards as well as cash, PayPal, Skrill, and via cheque. Deposits into a player’s account may be processed as quickly as immediately or as long as 5-10 working days, depending upon the payment method used. Withdrawals from a player’s account through PayPal take 1-4 hours, cash processes immediately, and betting via Visa or cheque can take 5-10 business days to process. Fortunately the site has a comprehensive list of accepted payment methods, allowing players to choose the ideal method for them. Betting maximum limits vary by game or location, but the minimum is five pounds or Euros per wager or transaction. PaddyPower.com is a great starter site for the novice gambler. The odds are clearly expressed and players have the option to view these as fractions or decimals. Fractions are by far the easier option for gamblers who are not familiar with how to decode this information, but once a choice is made the site automatically updates all pages viewed to the chosen readout method. Payouts are processed through the same method as the initial wager, unless the player requests another method. These usually post to a player’s internal account within minutes and often instantaneously, but site and Internet speed lag may prevent the information from being reflected right away. This is a more common problem when playing on a mobile device. Players must request a withdrawal from the site, and the payout method reflects the method by which the original wager was placed. Withdrawal times vary from instantly to up to 10 business days. For all payouts a minimum account balance of 10 pounds or Euros is required, or double the minimum opening wager. PaddyPower.com takes site security and unlawful or underage gambling very seriously. The site is secured by a 128-bit SSL encryption, the standard for transmitting sensitive personal and financial information. It also undergoes periodical audits by an independent third party to ensure all credit and other financial information provided to the site is secure at all times using a protocol known as PCI or Payment Card Industry standards. When a credit or debit card is used to open an account, PaddyPower checks the card to ensure it is real and not fictitious or fraudulent. PaddyPower may also require proof of age, particularly from young people claiming to be of legal age to gamble in their home of record. These checks and balances help ensure users are not engaged in unlawful activity. If PaddyPower finds any indications of fraud or other illegal activity, they may close or suspend the offending account at their discretion pending an investigation or further verification from the customer. While this may seem Draconian, it is a powerful method of preventing fraud among its users. 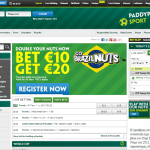 PaddyPower.com as an online betting service and virtual casino is required to comply with global gambling laws. Because of this, there is a lengthy list of places where one cannot start an account, such as Iran, China, and the United States. South Korea, Japan, the UK, Portugal and Greece are all places where such an account can be started. So long as one’s home territory of record is not included on the list of restricted territories, an account can be started and gambling is permitted. However, note that PaddyPower.com may not always give notice when adding to or deleting restricted territories, so it is well worth checking every once in a while to make sure you can still legally play in your jurisdiction. Players are not restricted to simple betting, although some of the novelty bets are quite interesting. Players can bet on anything from how global stock markets will perform over a given period to the outcome of the 2016 US presidential elections or even the existence of aliens. What really sets PaddyPower.com apart is the live interactive gaming, where players “sit” at a table with a live dealer and play just as they would in an actual casino. Offerings include Baccarat, blackjack, casino Texas Hold ‘Em and roulette. Table limits vary based upon the game, but range from .50 to 10,000 pounds or Euro. The dealers are friendly and professional, giving players the feel of a real casino experience. Cocktail service, unfortunately, is not supported at this time. This is in addition to the race and sports book action and live bingo and keno, which is good news for the player who enjoys some variety in their gaming. Unlike many online sites which treat gaming as serious business and therefore tend to be a little uptight, PaddyPower.com is not afraid to demonstrate a sense of humor. Expect the occasionally risque or ribald joke or pun as well as good-natured ribbing from the dealers and other players. The site’s jokes tend to be fairly dry and Continental, but the dealers like to have a good time and ensure their players are as well. Little quips, asides and humorous observations frequently accompany the site’s descriptions and offerings, making PaddyPower.com a fun place to play. Think of it as a neighborhood casino you can access from your own home, where you know the dealers and are on good terms with them. Overall, PaddyPower.com earns a 4.7 out of 5 stars. The site interface could use a little jazzing up, and the humor can occasionally be confusing to non-native English speakers. In addition, the lag in receipt of funds depending upon payout method can sometimes create problems and frustration, although the site has an entire Q&A on responsible gaming in which it says you shouldn’t bet your house payment tonight if you’re likely to need it tomorrow! For the casual player, this shouldn’t pose a problem, but be aware it could be an issue if you’re betting more than you can really afford to lose. PaddyPower makes up for its relatively minor deficiencies with a clear, straightforward explanation of odds, payouts, and policies and terms of the site. The skeletal site structure isn’t exactly visually appealing, but the humor expressed makes up for it and should pose no obstacle to the player who’s really there to make a friendly wager. In addition, this is an excellent starting site for players who are unfamiliar with casino play and how betting in general works. Why not make your next night in a night out in PaddyPower’s virtual casino? You’re almost certain to have a great time, without leaving the comfort of your home!